For the month of June, 33 stocks repurchased 74.6 million shares for a total consideration of S$174.0 million. 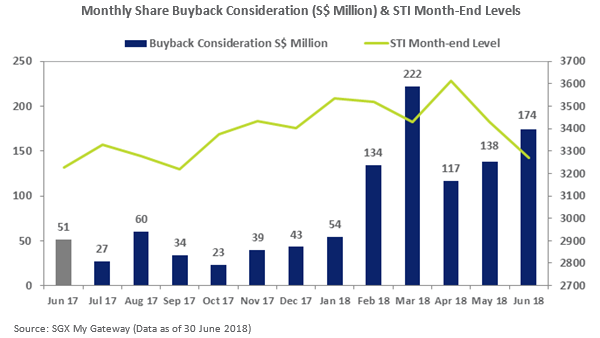 The buyback consideration was up 26% from S$137.9 million in May and the third highest reported monthly consideration since Sep 2015. The 33 stocks included nine STI constituents - CapitaLand, UOB, Keppel Corp, OCBC, SATS, Yangzijiang, Venture, SPH & Sembcorp Industries; which made up as much as S$155.4 million of the S$174.0 million consideration. CapitaLand led the June tally with the repurchase of 17.2 million shares for a consideration of S$60.8 million. The largest buyback consideration posted by a non-STI stock was by Wing Tai Hldgs, which bought back 2.3 million shares for a consideration of S$4.5 million. Total share buyback consideration for the month of June 2018 reached a three month high, with a total consideration value of $174.0 million. This was the third highest monthly consideration value since September 2015 when the month’s buyback consideration totaled S$445 million. Over the month of June, there were 74.6 million shares repurchased by 33 companies. The buyback consideration was up 26% from the S$137.9 million recorded in May 2018 (click here for more details). During the month a number of stocks commenced new mandates including - Keppel Corporation, Wing Tai Holdings, Q & M Dental Group (Singapore), SingHaiyi Group, Memtech International, Sembcorp Industries, OUE, Telechoice International, AEM Holdings, Health Management International, Tiong Seng Holdings, Mun Siong Engineering, Koda, Annaik, CDW Holding and S I2I. The Straits Times Index (STI) declined 4.7% for the month of June bringing its dividend inclusive decline in total return to 2.3% for the first half of 2018. This compared to the benchmarks of Australia, Hong Kong and Japan, registering SGD denominated average total returns of 1.2% for the six months. The 5 stocks with the largest buyback consideration value last month were CapitaLand, United Overseas Bank (“UOB”), Keppel Corporation, Oversea-Chinese Banking Corporation (“OCBC”) and SATS which made up 81% of the S$174.0 million in total consideration. Together, nine STI constituents - CapitaLand, UOB, Keppel Corporation, OCBC, SATS, Yangzijiang Shipbuilding Holdings, Venture Corporation, Singapore Press Holdings and Sembcorp Industries made up as much as S$155.4 million (89.3%) of the S$174.0 million in consideration. The table below summarises the buyback considerations in June 2018. The table is sorted by the value of the total consideration amount for the month, which combines the amount of shares purchased and the purchasing price of the shares. * percentage of company’s issued shares excluding treasury shares as at the date of the share buyback resolution. Note: Table does not include overseas buyback transactions conducted by Inch Kenneth Kajang Rubber PLC.